Nevermind. 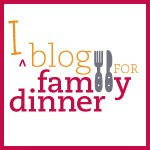 Family dinner can take place any night and there's always another day for blogging. So here's my jump start on October, more about family day and other recent articles of interest. Dinner Makes a Difference! Casa's Family Day was Sept. 22, 2008. Next year's is Sept 29, 2009. The Public Service Announcement is a beautiful thing. Don't wait! You can start a new routine of family dinner any day! More tips on family dinner here and tips on talking about drugs and alcohol here. Momma, I'll have Some of What Your Having. Keith Dixon, NYT, 09.30.08. What a great article! We loved the Happy Baby Food Mill and used it right at the table to crush up the dinner food for our littlest one. I didn't have the gagdet for our other kids, but the blender worked well for leftovers. All my kids are adventurous eaters and I really think it's becuase we gave them real table food from any early age. Try it! 6 Food Mistakes Parents Make. Tara Parker-Pope. NYT, 09.14.08. I totally agree with every single one. Rachael Ray Wants Kids in the Kitchen. Tara Parker-Pope. NYT, 09.14.08. Back to School Lunch Ideas from Epicurious and the authors of Real Food for Healthy Kids. A New Tasting Menu in the Baby Section. Dana Bowen, NYT, 08.02.08.